Fall for me means long walks wrapped up seeing how the season changes and part of that, is looking out for items that are distinctively autumnal. 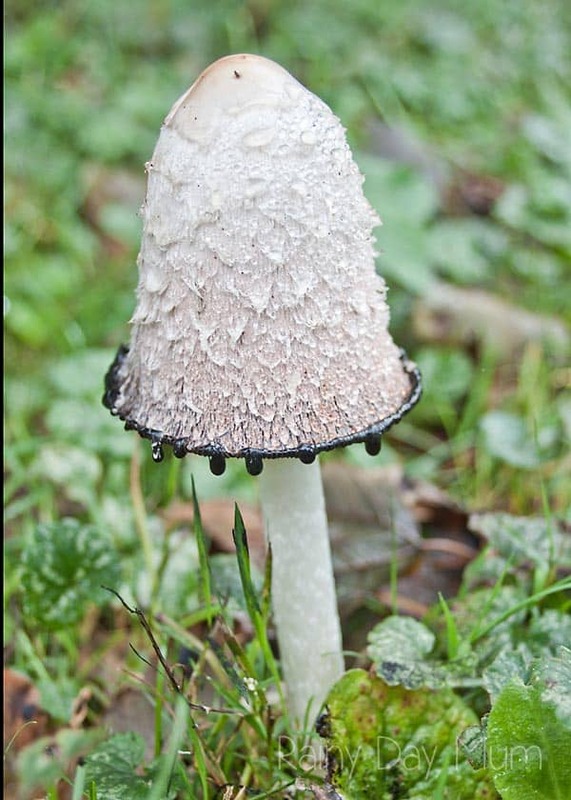 Fungus or mushrooms and toadstools are found throughout the year but because of the dampness and the fact that the temperatures aren’t really that low yet they flourish and can be found on the ground and growing on trees. 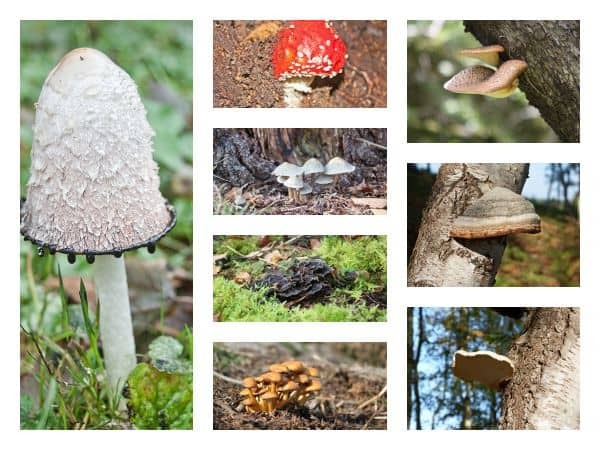 For this weeks, #TeachECE theme we are focusing on Fall STEM and for our part we’ve got a Fungus Investigation including a FREE STEM Printable for you and your young children to complete. 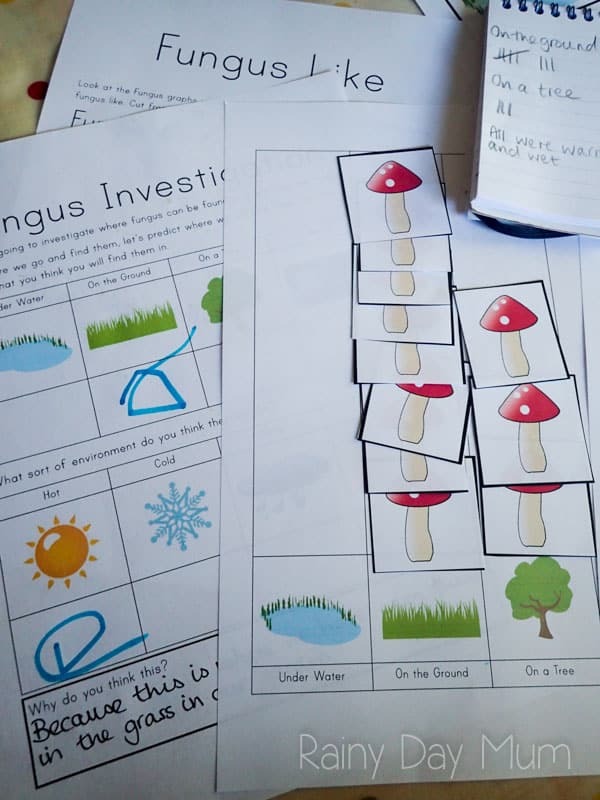 Print out the printable and cut out the final two sheets – if you know that there will be lots of Fungus on your nature walk then make double copies of the Fungus Sheet. We sat down together and looked at a collection of books that I found which featured mushrooms and toadstools – from fairy stories where toadstools were the fairies homes, a season book which featured mushrooms and also one of our nature guides for the kids which had a page on fungus that they can spot. 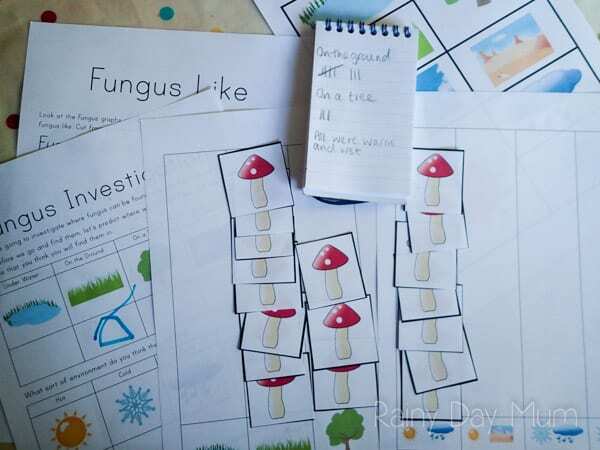 If you have a mixed age group with younger toddlers then you can make this a visual hunt find out how we did it with our Toadstool and Mushroom Fairy Home Hunt. Using these, I explained that we were going on a fungus hunt in the woods near our house (if you have fungus growing in your back yard you could do the investigation there as well). I showed the prediction sheet (first sheet) and asked the two questions. T made decisions that they would be found on the ground as she had seen mushrooms in the grass in our garden and that they liked hot and dry places because or grass was always dry, apart from when we have the paddling pool out. After that we headed off on a nature walk – I reminded T that fungus can be poisonous so we would be looking for fungus with only our eyes and no touching any of it. I carried a small notebook with me and when we saw a fungus I made a tally next to the place where we found it and what the conditions were like. Returning home we sat down together and I brought out the fungus pictures and the notebook and we sat and created a graph from our observations on the walk. 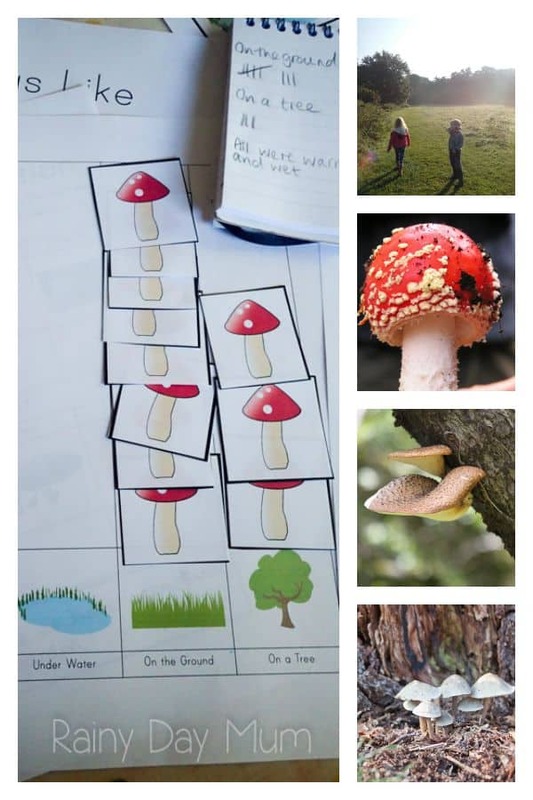 Sticking fungus into the correct column on the graph and then counting how many we had discovered in each location and what sort of conditions they liked. 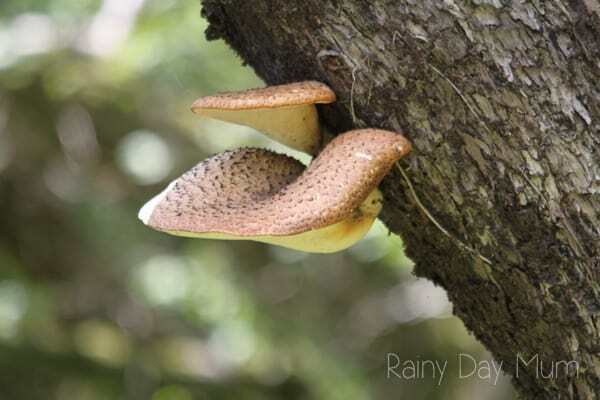 We then sat and filled in the conclusion deciding that Fungus could be found on the ground and on trees and that they liked Warm and Damp conditions like under trees and in mud. COOL FUNGUS PHOTOS! 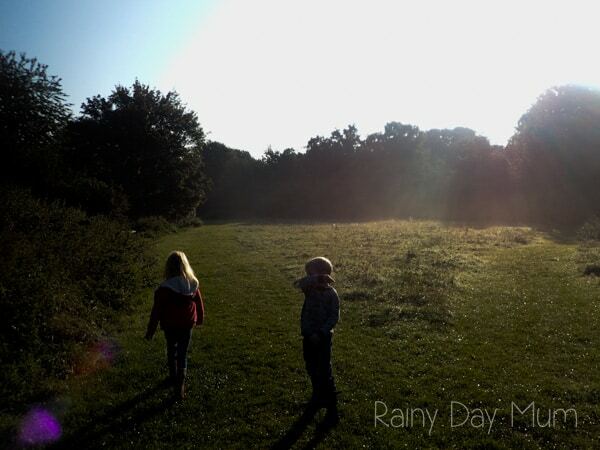 :) I love natural explorations and experiences for kids that promote inquiry! Thanks for the printables, too! We have some really neat fungus growing in our yard. I’ll have my kids photograph it to show you! Love this investigation and can’t wait to see how our results turn out. Oh, how cool! It’ll be interesting to compare what we find here in the US with what you found! I’ll post on Instagram and tag you! Perfect timing! We just discovered a patch of fungi at the park today. You have such an amazing outdoor space to explore! I’m in awe of all the fungi you found! Those photos are just gorgeous! I love everything about this activity, and my son would love it! If we catch any good fungus photos, I’ll share with you (we’re in the US). Awesome photos. 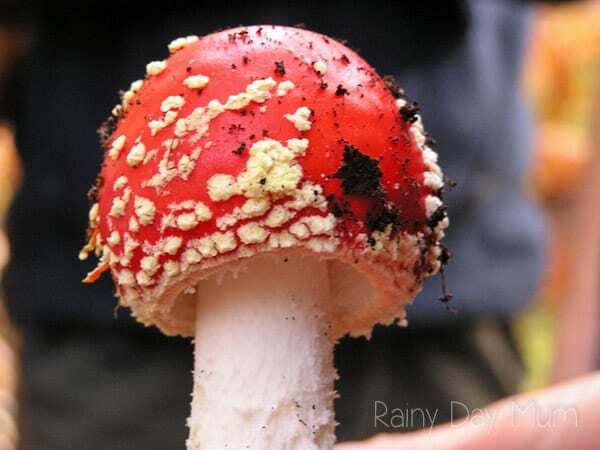 We have seen some fungus around us but they all look the same. Been while since I took us in the woods but after reading and seeing your photos, I know what i have planned for next weekend. Wonderful pictures! We have not had the chance to get out and search for mushrooms, but this is a great motivator! Wow! I want to go on your nature walk! Those pictures are incredible. What an awesome activity.